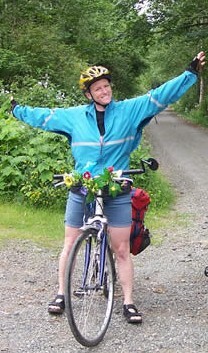 Joyriding - Discover or rediscover - the joy of riding a bike! Discover or rediscover - the joy of riding a bike! Riding a bike doesn't need to be difficult or scary, and it's not just for kids or athletes. You don't need to wear spandex, and you don't need to shower afterward. Cycling is a normal everyday activity, and is entirely possible for many people, if they have some knowledge and skills. The great part is that these are things that can be learned. If you would like one-on-one lessons, taught by a experienced and friendly cycling instructor, that are tailored to your individual skill, fitness, knowledge and comfort level, contact us. Read about the different people who want a Joyriding lesson.